I was reminded of my post questioning the viability of Caribbean islands in an era of worsening natural disasters when I began reading reports of the devastation wrought on Puerto Rico by Hurricane Maria. Hurricane Maria is Puerto Rico’s worst in nearly a century, a double blow as it follows the destructive Hurricane Irma by just two weeks. The costs, both human and financial, have only begun to come into view. This much is certain: the U.S. territory, bankrupted by runaway debt, now confronts an even deeper economic crisis. Four months after the island’s government sought protection from creditors in the nation’s largest municipal insolvency, the odds of a speedy resolution now appear to be dimming. President Donald Trump said Thursday he plans to visit the island and declared Puerto Rico a disaster zone, which helps clear the way for federal assistance. Already, the financial aftershocks of Hurricane Maria have begun to ripple through the U.S. financial industry. Prices on Puerto Rico general-obligation bonds maturing in 2041 fell to 48.7 cents on the dollar as Maria raked the island, down from 52.6 cents last week. It was another sign that bondholders increasingly doubt the island’s ability to repay what it owes. The National Guard and the U.S. Federal Emergency Management Agency were assisting Puerto Rico in restoring power, Governor Ricardo Rossello told reporters Thursday. He urged residents to stay off the streets and remain calm as many are still unable to communicate with family members. That includes the governor himself, who hasn’t been able to reach his parents. A key priority is reopening the port in San Juan to bring in generators, food and water, Rossello said. Legal issues should be put on hold as the island grapples with the aftermath of the storm, a judge advised the parties involved in Puerto Rico’s restructuring, according to Reuters, which didn’t name the judge. The financial situation was dire before Maria hit. The island’s economy has been contracting for a decade, sending a stream of residents to find work on the U.S. mainland. As Puerto Rico faces catastrophic damage, it must restore the health and safety of its citizens while navigating the bankruptcy process to help it reduce a $74 billion debt load and a broke pension system. Among the economic questions, one of the biggest is how Puerto Rico can reverse its out-migration. About 400,000 people have left the commonwealth since 2008. The seriousness of the emergent humanitarian crisis on the island is only becoming clear, as is the increasingly laggard, even dismissive American official response under Trump. Arguments that Trump's failure to respond as effectively to a disaster impacting four million American citizens as the Obama presidency did to--for instance--the 2010 catastrophe in Haiti are rooted in anti-Hispanic racism have been reported by (among others) the Toronto Star's Daniel Dale. Certainly's Trump mock-Spanish pronunciation of Puerto Rico is unfathomable, as are the many other things he has said. As Puerto Ricans drive around the island for days in search of a cell signal and Puerto Ricans remind the United States that they are also Americans and New York State mounts its own aid effort for want of federal intervention, a catastrophe is unfolding. Demographic trends are at the heart of many of Puerto Rico's current and potential future issues. As Mark Hugo Lopez and Gabriel Velasco noted for Hispanic Trends at the Pew Research Group, in their June 2011 survey "A Demographic Portrait of Puerto Ricans", though there are eight million people of Puerto Rican descent in the United States, at the time these two were writing only half of them live in the jurisdiction of Puerto Rico. Half lived on the American mainland, a consequence of heavy migration from the Caribbean island to the mainland United States starting perhaps a couple of decades after the American conquest of the island from Spain in 1898, after Puerto Ricans were granted American citizenship. Until recently, relatively high fertility counterbalanced emigration and allowed for continued population growth. In recent years, however, the island has begun to experience a declining population. This emigration slowed down in the 1970s and 1980s as Puerto Rican incomes began to converge on those of the mainland United States but accelerating again after the 1990s, when the island's economy began to lag again following the expiration of tax incentives intended to spur industrial development on the island. The Puerto Rican economy has experienced unending recession for the past decade, government debt spiraling as GDP has fallen. The island remains rich by international standards, with GDP per capita roughly on par with that of Poland and Latvia and ahead of nearly all of Latin America. Just as Poles and Latvians, however, have responded to the relative poverty of their homeland by leaving for richer points as soon as they could, so have Puerto Ricans also left. A migration once centered on New York State, especially New York City, began to find other destinations, Florida for instance emerging as a major new destination for Puerto Rican migrants. Forbes's Tim Worstall is hardly alone in noting that Puerto Ricans could, and in fact are, respond to the inevitable economic deterioration of the island by leaving. That this migration of people, especially of productive workers and young families, will make the island's finances more difficult to manage is inevitable. While the court proceedings could eventually make the island solvent for the first time in decades, the more immediate repercussions will likely be grim: Government workers will forgo pension money, public health and infrastructure projects will go wanting, and the “brain drain” the island has been suffering as professionals move to the mainland could intensify. 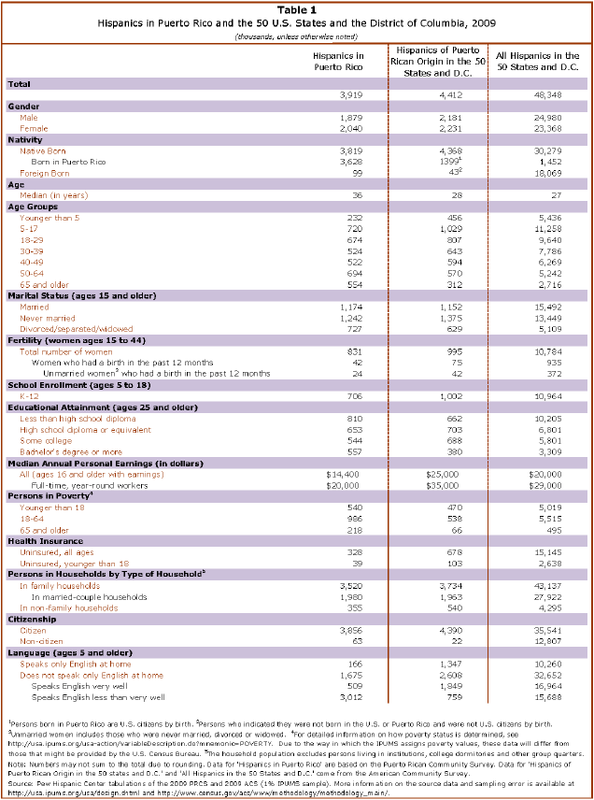 The population figures, which were released last month, illustrate how Puerto Rico’s fiscal and economic crises are likely to worsen. Puerto Ricans are American citizens, and as they leave the island to seek employment or retirement in the U.S., the island faces a shrinking tax base to pay for debts incurred over the past decade. 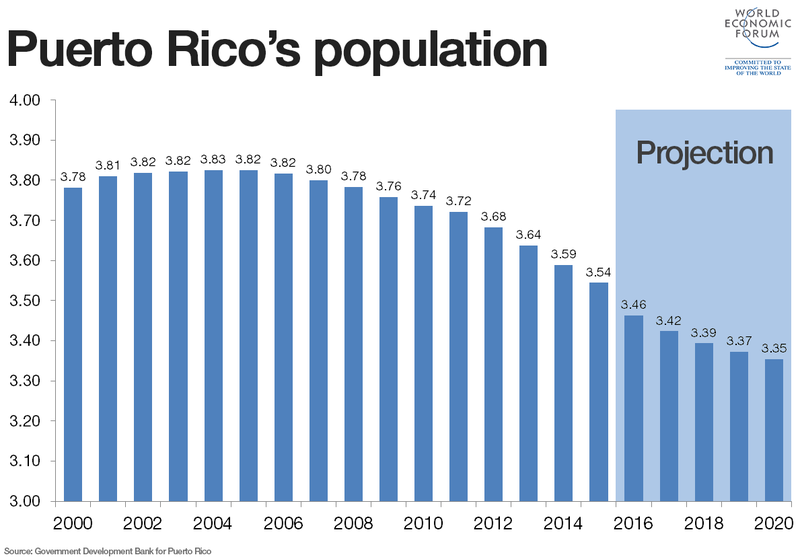 The Census Bureau report showed that Puerto Rico’s population fell 1.7% in the year ended June, an acceleration from the 1.6% decline for the year before that. The island’s population has fallen by more than 1.1% for five straight years. This newer, or perhaps just realised, problem is that the population can just up sticks and leave: but the debts get to stay behind. And an economy that has a shrinking tax base and yet a static debt can all too easily fall into a death spiral. The debt per person, and the taxes needed to pay it, rise ever higher, leading to more of the productive population leaving and that raises the debt per productive capita again and thus the tax rate on those who remain. This again speaks to Puerto Rico's specific legal status. Anyone and everyone can just get on a plane or a boat to the mainland. No visas are required, there cannot be an exit tax applied to them, they cannot be forced to take a piece of the debt with them. In this sense it's just the same as moving from one US state to another. It isn't like trying to move out of the US Federal tax net, where you do have to pay up all the taxes that you would owe even up to the point of unrealised capital gains and so on. Nope, just go and leave the debt behind. Demography blogger Lyman Stone observed, looking at data on passenger traffic to and from the island, that the scale of net emigration from Puerto Rico is serious. He has observed that, according to some plausible scenarios, Puerto Rico might be set for a population collapse greater than that experienced by island after the 1840s, with the possibility of the island's population falling by half or more. All this was before the catastrophe of Hurricane Maria. With the island's infrastructure devastated, and with economic sectors like agriculture wrecked, with no sign of an immediate recovery to a reality that had already been dire, and with Puerto Ricans being American citizens with the right to move, how many people will stay? Megan McArdle's suggestion, based on the precedent of New Orleans after Hurricane Katrina, that 30% of Puerto Rico's population might leave does not sound obviously implausible. Stone's suggestion of a sharp fall in the population of Puerto Rico does not seem impossible. What will be done about this? A migration of such a scale will obviously have huge consequences for the United States. New York City may not be suitable for new Puerto Rican migrants--climate refugees--given its dearth of affordable housing, but family connections between Puerto Ricans on the island and the mainland make it a natural destination. Florida, in particular, may also become a major destination. Lauren Ritchie's suggestion in the Orlando Sentinel, based on interview with Puerto Ricans and migration experts alike, that Orlando may be as much remade by Puerto Rican migration as Miami was by Cuban migration certainly sounds possible. How will this effect--for instance--state politics? What will happen to the island of Puerto Rico and the people on it? Will the island finally be integrated firmly into the American federation, as a state as a bare majority of Puerto Ricans wish?